Celebrate National Doughnut Day with a fresh and unique doughnut from Fractured Prune. Celebrate National Doughnut Day Nov. 5 with a circular treat as unique as you by visiting Fractured Prune Doughnuts. The scent of the fresh-baked treats meets your nose the moment you walk into any one of Fractured Prune’s eight Arizona locations. Outstanding service provided by the smiling, eager staff is always part of the experience when you stop by to pick up a dozen (or two) doughnuts. Richard Ortega, regional manager of Fractured Prune Doughnuts AZ, is an expert in all things Fractured Prune and is excited to celebrate the lesser-known Nov. 5 date of two holidays celebrating America’s favorite morning treat. The Fractured Prune menu beckons customers to create their own delectable doughnuts with 19 glazes and 13 toppings from which to choose. 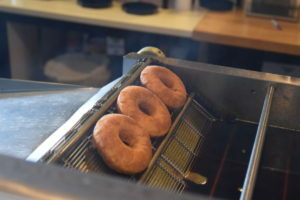 Or, if narrowing it down is too challenging, the shop offers its own customizations, including the OC Sand doughnut covered in honey glaze and topped with cinnamon sugar, the Morning Buzz with mocha glaze and cookie crumbs and many more. After serving the custom-created treats for nearly two years in Phoenix at CityScape, Ortega is excited that Fractured Prune is part of a growing downtown. Ortega drew from his years of experience to provide an inside look at Fractured Prune. What makes Fractured Prune unique? We have the capability to create so many flavors and add so many different toppings, the possibilities are endless. Unlike other places, none of these doughnuts are picked from the case; each doughnut is made fresh to order. 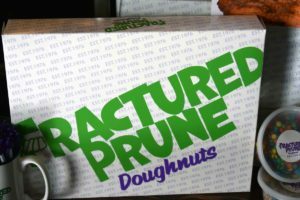 Why the name Fractured Prune? The owner named Fractured Prune after Prunella Shreik. Shreik was spunky and earned the nickname “Fractured Prunella” for the broken bones she suffered while competing in traditionally men’s sports into her 70s. We have a doughnut on our board for her as well, called “Ms. Prunella” it’s got mixed berry glaze and cinnamon sugar on it. With so many options for glazes and toppings, what’s the most surprisingly good doughnut you’ve had? Definitely a donut with our honey BBQ sauce, topped with bacon. At first you think no way, but since the dough isn’t too sweet it makes for a good savory sandwich. Similarly we have a donut chicken sandwich that is only sold at Talking Stick Arena during Phoenix Suns games. – Written by Alexie Chavez, marketing coordinator.